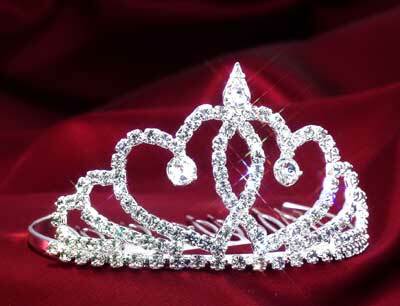 135 mm diameter tiara with silver finish and leaf shaped diamante decoration. 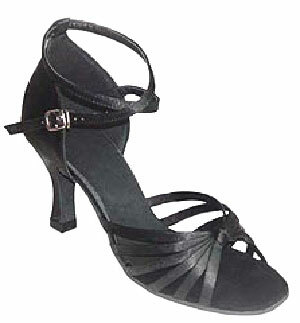 Chain style clasp to adjust to the individual head size. 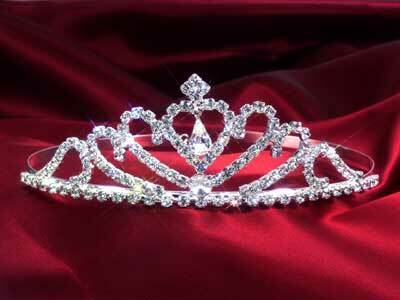 135mm diameter tiara with silver finish, and leaf shaped diamante decoration. Chain style clasp to adjust to the individual head size. 80mm diameter tiara with gold finish and diamante decoration. Integral comb to hold tiara in hair style. 80mm diameter tiara with gold finish wire style decoration and diamante with centre pendant. Integral comb style to hold tiara in hair style. 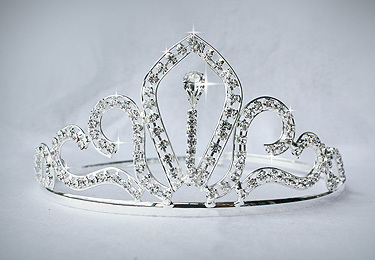 80mm diameter tiara with silver finish and heart shaped diamante decoration. Integral comb style to hold tiara in hair style. 80mm diameter tiara with silver finish wire style leaf shapes and diamante decoration. Integral comb style to hold tiara in hair style.